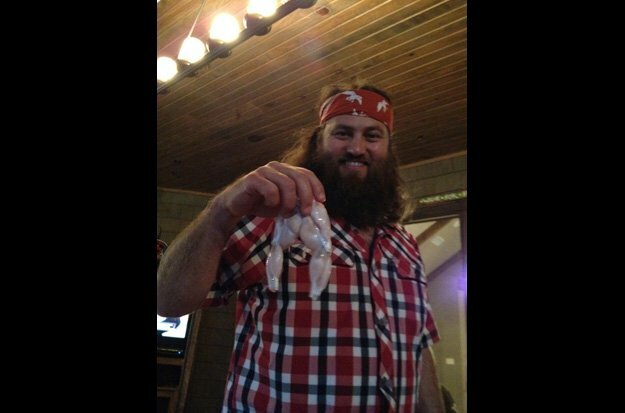 One of Willie Robertson’s favorite recipes is Garlic Frog Legs. The Duck Commander CEO and Duck Dynasty star said: “Many things in life – whether it’s food, business, or even someone’s personality – slowly evolve over time. They don’t necessarily get better overnight, but if you keep working at them and stay focused, chances are they’re going to end up being better than when you started. Take for instance my recipe for frog legs. When I was growing up, Kay’s frog legs were one of my favorite meals. But as I got older, I started experimenting with ways to cook frog legs and added my own personal touch to her recipe. Kay has probably never heard of garlic-infused grape seed oil (she’s never used anything but butter or Crisco), but that’s what I like to use to fry my frog legs. And for the record there are many infused olive oils I like using nowadays. Kay still doesn’t understand how they “infuse” oil, but I tell her, <<Don’t question, just enjoy>>. Soak frog legs in beer for an hour or so. Season frog legs with Zesty Cajun Style Seasoning. Roll frog legs in flour and set aside. In a large black skillet bring butter and grape seed oil up to high (don’t burn the butter, it will brown when burning). It doesn’t take much oil and butter, just about a half-inch or so. When oil and butter starts sizzling, put frog legs in and brown on each side. It should be about halfway up on frogs, just enough to brown. If butter gets low, throw another half stick in. Set browned frog legs aside. With what’s left in the pan, add white wine, garlic (whole pods, peeled), mushrooms, and cook for three to four minutes.